She Captains : Heroines and Hellions of the Sea by Joan Druett, Jooan Druett Mention the word "pirate," and you'll likely conjure up an image, courtesy of Robert Newton's scenery-chewing performance in the 1950 film adaptation of Treasure Island, that features a peg-leg, a parrot, and a mighty "arrrgh." 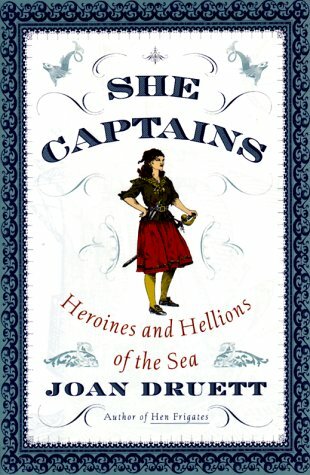 Hen Frigates : Passion and Peril, Nineteenth Century Women at Sea by Joan Druett (Paperback - May 1999) A "hen frigate," traditionally, was any ship with the captain's wife on board. Hen frigates were miniature worlds -- wildly colorful, romantic, and dangerous. Here are the dramatic, true stories of what the remarkable women on board these vessels encountered on their often amazing voyages: romantic moonlit nights on deck, debilitating seasickness, terrifying skirmishes with pirates, disease-bearing rats, and cockroaches as big as a man's slipper. And all of that while living with the constant fear of gales, hurricanes, typhoons, collisions, and fire at sea. Interweaving first-person accounts from letters and journals in and around the lyrical narrative of a sea journey, maritime historian Joan Druett brings life to these stories. We can almost feel for ourselves the fear, pain, anger, love, and heartbreak of these courageous women. Lavishly illustrated, this breathtaking book transports us to the golden age of sail.